Have you tried your hand at tack fusing? Fusing is a technique used to bond together pieces of glass using heat from a kiln. Tack fusing is a form of fusing that allows some textures, composed while cold, to stay partially intact after the fusing process has taken place. 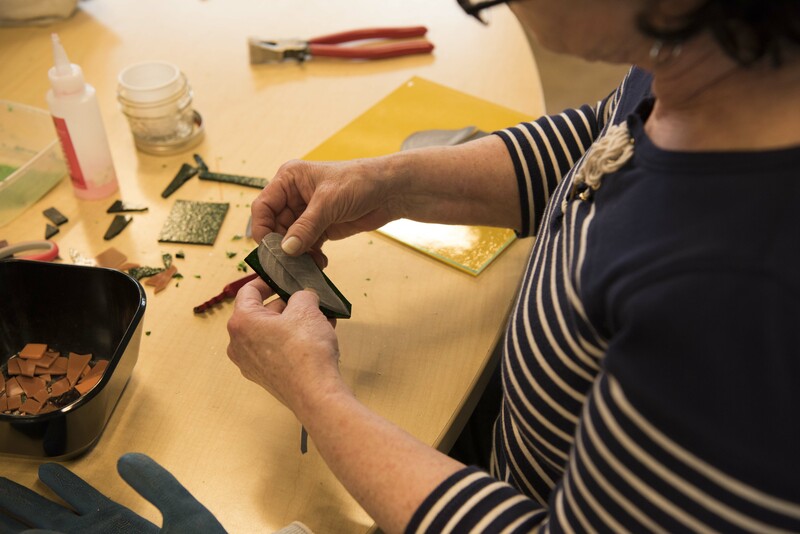 Museum of Glass now offers seasonal tack fusing projects, including Santas and wreaths during the holiday season and conversation hearts on Valentine’s weekend. 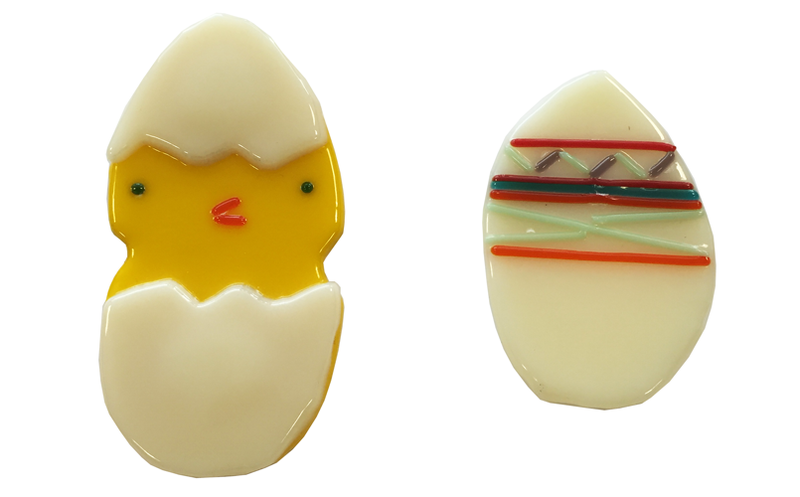 The next seasonal project, Easters eggs and hatching chicks, will take place on March 12 and 13! Fusing opportunities take place on the second full weekend of each month. On months with no seasonal project, MOG will revert to its traditional full fused tile making workshops. 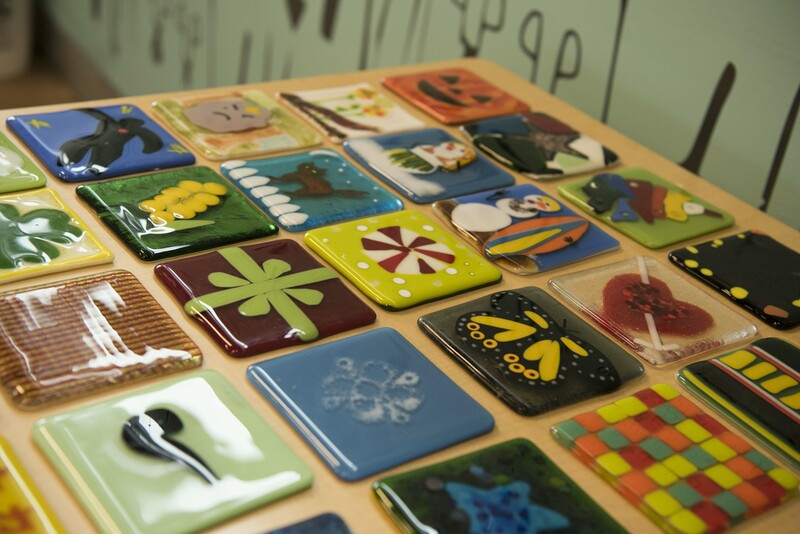 Visit our website for all upcoming fusing activities! This entry was posted in Art, Glass, Hands-on, Museums and tagged Easter, Fusing, glass, Hands-on art, Museum of Glass, Tack Fusing on February 26, 2016 by Museum of Glass. 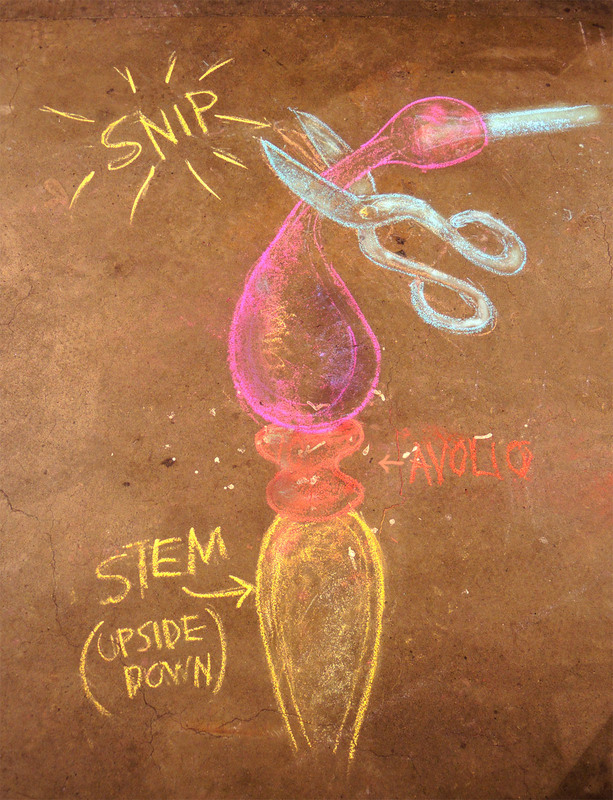 Chalk isn’t just for playgrounds and sidewalks. 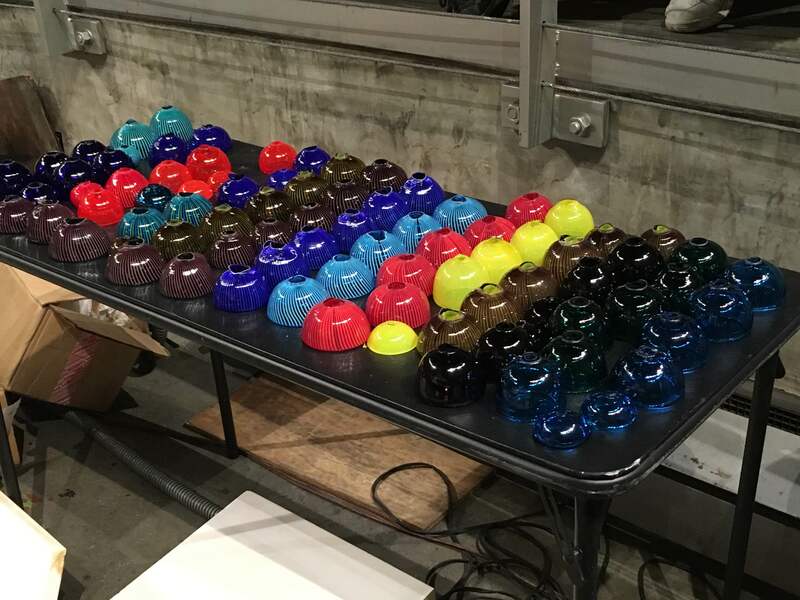 At Museum of Glass, you’ll find it on our Hot Shop floor! 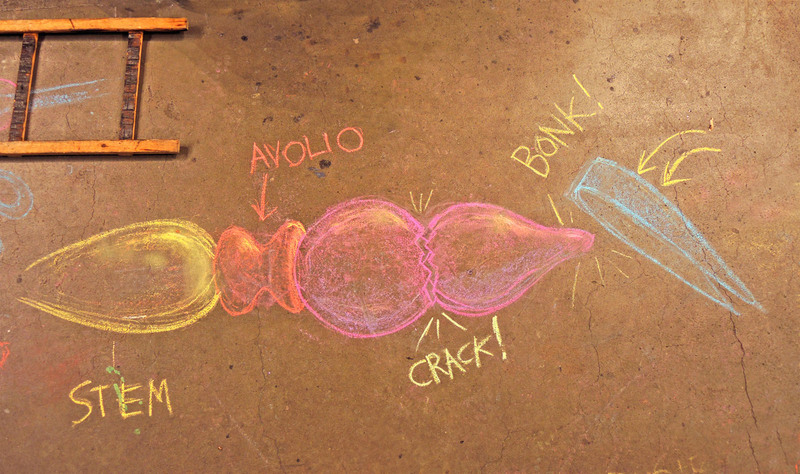 Walter Lieberman, artist and Museum of Glass Hot Shop emcee, began illustrating glassmaking techniques with chalk for Museum visitors in May of last year. The shape of glass can change in an instant, but Lieberman’s visual diagrams freeze these glassmaking moments in time, allowing audiences to fully absorb the demonstrated techniques. 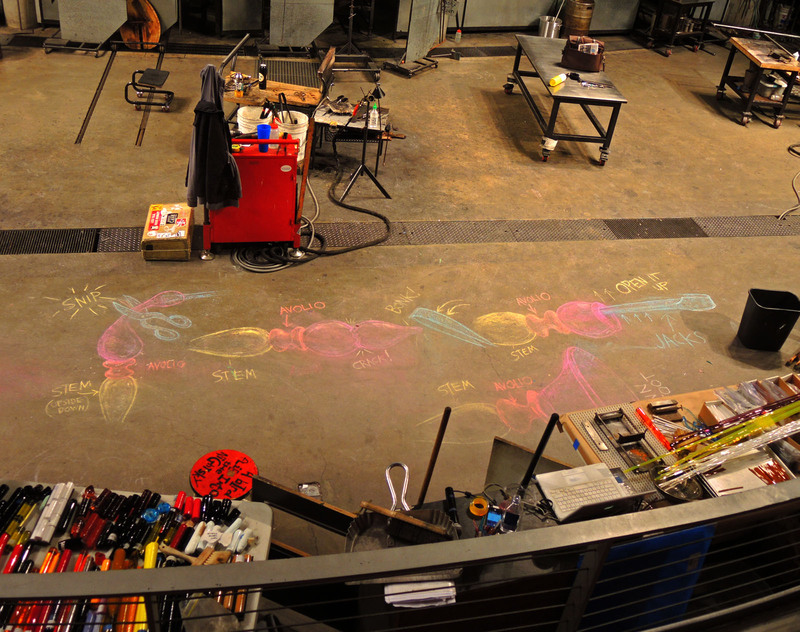 To see more Hot Shop chalk drawings, plan a visit to Museum of Glass! 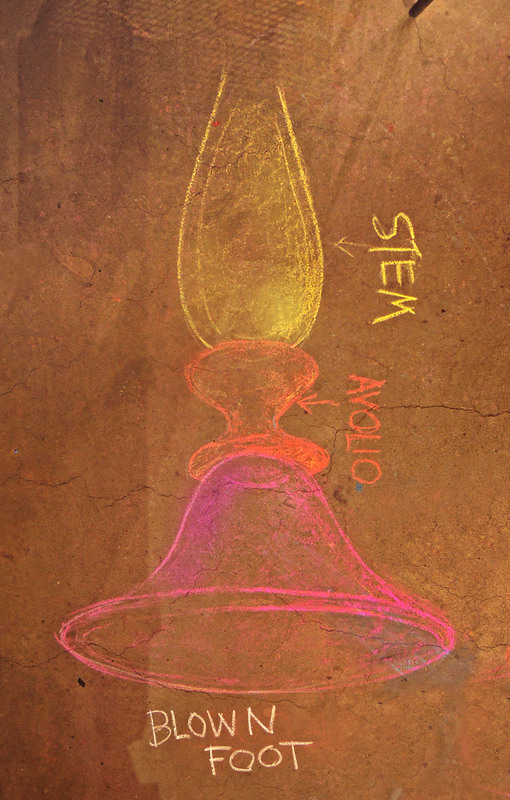 This entry was posted in Art, Glass, Hot Shop and tagged chalk, chalk drawings, glass, Museum of Glass, Walter Lieberman on February 20, 2016 by Museum of Glass. Lino Tagliapietra is in town and Museum of Glass is hopping! Lino actually arrived last week and prepared for his residency by making parts. 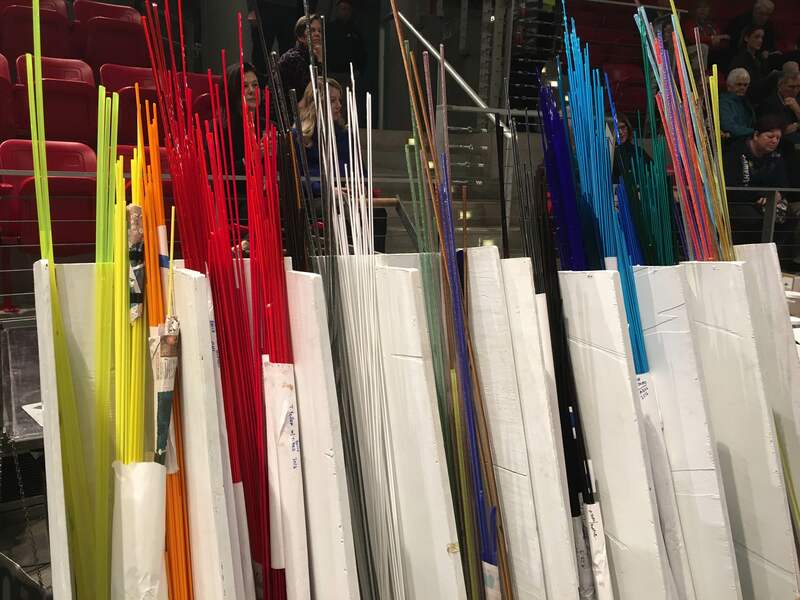 Lino, Jennifer Elek, Erich Woll, and our own Museum of Glass Hot Shop Team of Benjamin Cobb, Gabe Feenan, and Sarah Gilbert, worked together to pull hundreds of feet of cane, which will be used to create the expressive lines in Lino’s pieces this week. Then, they picked up bundles of cane and made it into various other canes and murrine. 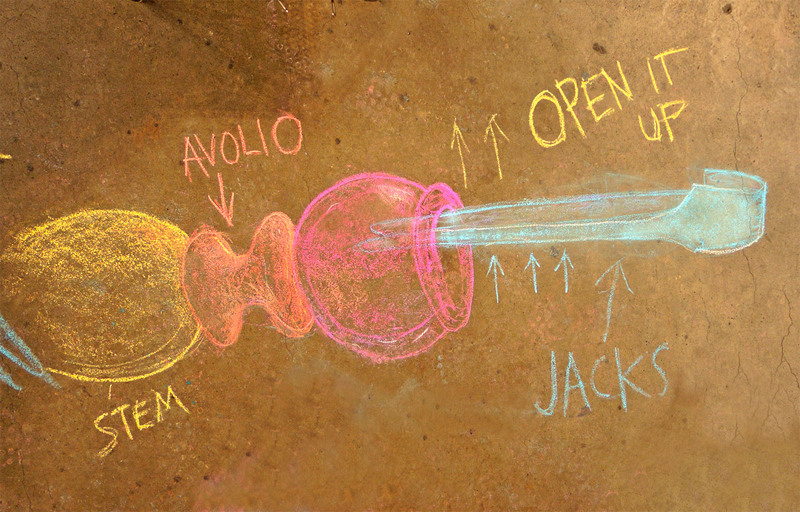 Some of the parts were made into long, narrow bubbles, which were then cut apart into smaller sections. All of these parts will be recombined over the next two weeks. First thing Wednesday morning, Lino laid out patterns of murrine onto a slab of ceramic kiln shelf. Murrine is the name for small tiles of glass, often with intricate patterns encased inside. Murrine is made by bundling canes together with wire, and then heating them up again and pulling them into more cane, sometimes with a square profile. 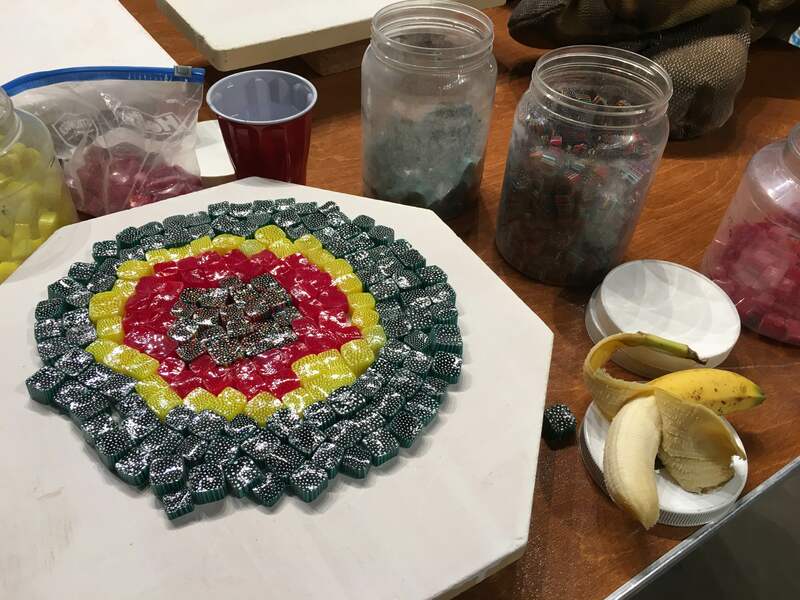 Erich Woll is an expert at making these murrine, and he makes nearly all of the murrine that Lino uses. 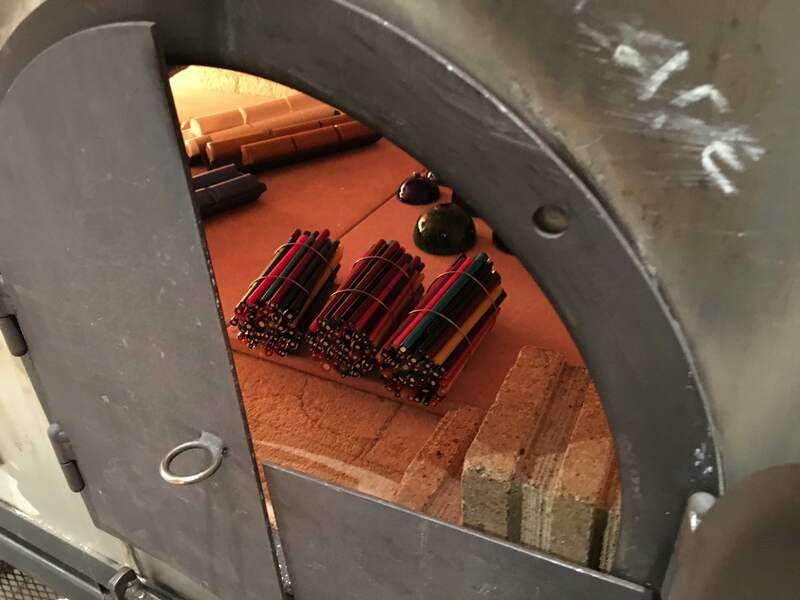 Once the murrine has been stretched out long and cooled, it is chopped into smaller sections and laid out on a kiln shelf (like the one in the photo above). The entire set up is then reheated and squeezed together. 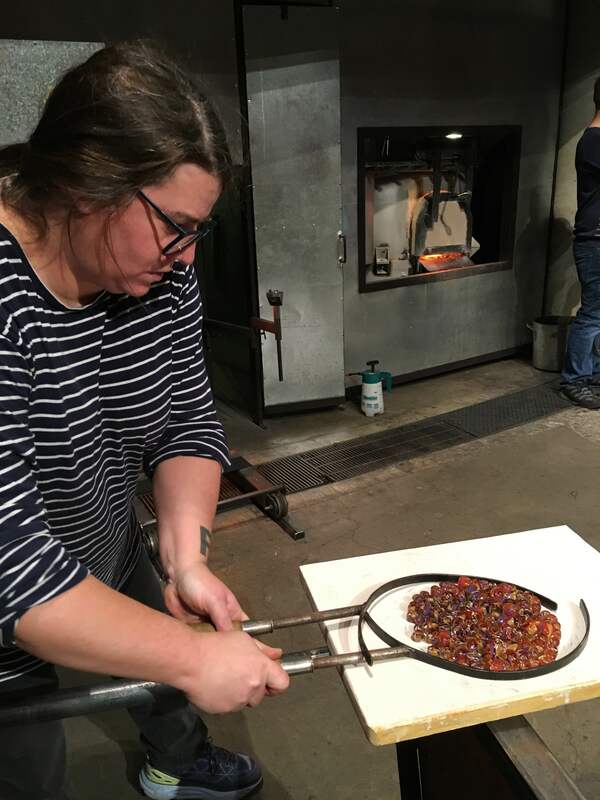 Jennifer Elek is responsible for blending all of those small parts together into a flat disk, which is then picked up on a clear, glass bubble. Once the piece gets picked up on a clear collar, it is formed into a round bubble and handed off to Lino to work his magic. To see what Lino makes, tune into the Museum of Glass live feed from 9 am to 3:30 pm, Wednesday through Sunday during the next two weeks. This entry was posted in Art, Artists, Glass, Hot Shop, Museums and tagged Benjamin Cobb, cane, Erich Woll, Gabe Feenan, glass, Hot Shop, Jennifer Elek, Lino Tagliapietra, murrine, Museum of Glass, Sarah Gilbert on February 12, 2016 by Museum of Glass. 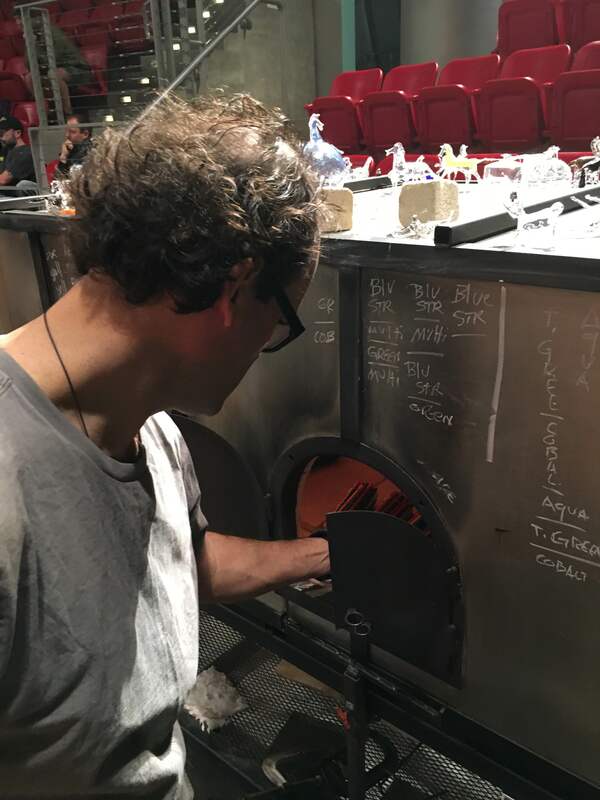 Maestro Lino Tagliapietra and his team have been in the Museum of Glass Hot Shop this week preparing for his two-week Visiting Artist Residency from February 10 through 21, 2016. 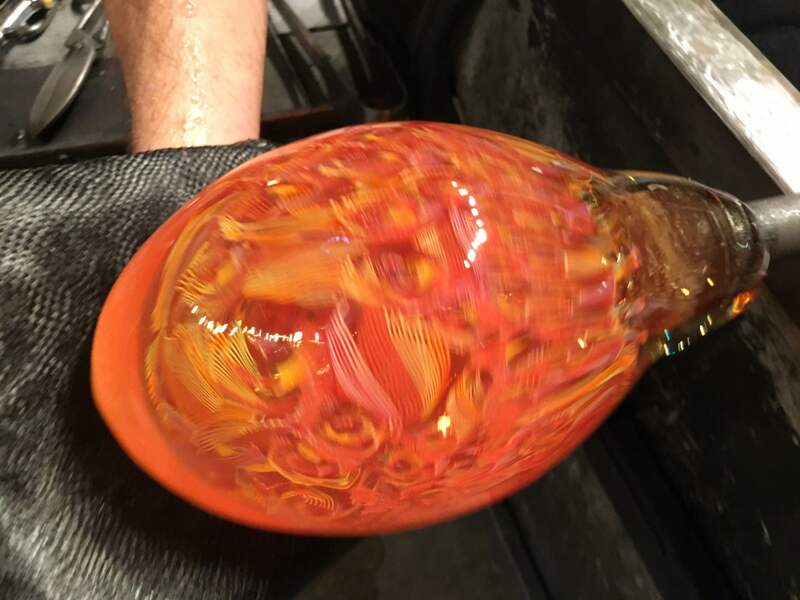 While Tagliapietra creates colorful cane, beautiful murrine, and intricate cups to use during his residency, YOU have a chance to win a fantastic giveaway to see the Maestro working on February 14! Entries must be submitted by 11:59 pm PST on February 10, 2016. A winner will be selected at random and notified by email or phone on February 11, 2016. Must be 21 or older to enter. Limited to one (1) entry per person, per email address. One contest winner will be determined by random drawing on February 11, 2016. This contest begins on February 3, 2016, at 12 pm PST and ends February 10, 2016, at 11:59 pm PST. Only entries submitted during this time frame are eligible. Employees of Museum of Glass as well as their immediate family members are not eligible. This entry was posted in Art, Artists, Glass, Hot Shop, Museums and tagged For the Love of Lino, glass, Hotel Murano, Lino Tagliapietra, Maestro, Museum of Glass, Tacoma, Valentine's Day on February 5, 2016 by Museum of Glass.